So if you buy a book solely because the cover is beautiful, or because the title is intriguing, then you accept the risk that the book might be not so good. But when you buy a book because you've seen it mentioned all over the place and because the plot sounds like ten different kinds of awesome, then you're your expectations might be somewhat higher. 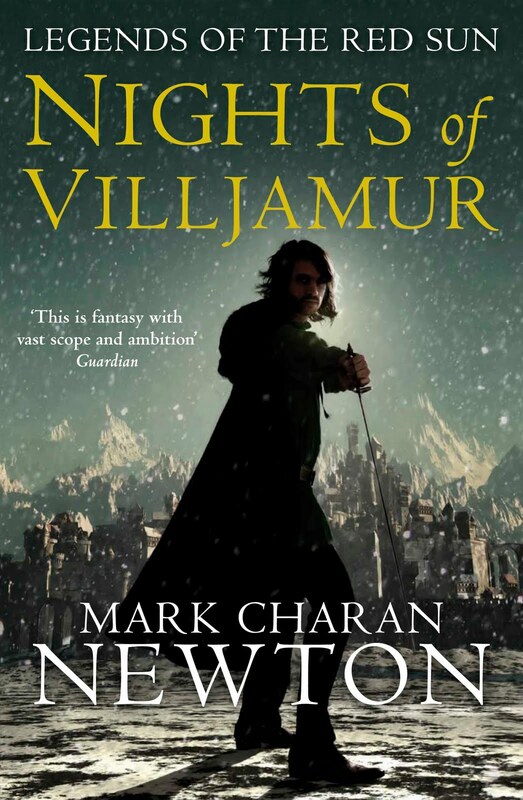 And yet, sometimes, the spur of the moment book will be fantastic and the anticipated one, well, let's turn our attention to Nights of Villjamur. A city scrambling to prepare for a fast approaching ice age, masses of desperate refugees pushing at its walls, is left leaderless when the emperor commits suicide. Someone, or something, is killing of important council members, and a dark cult is making a grab for power. Zombie like creatures are shambling around the countryside and a war is brewing. Seriously, all that stuff happens in this book. All that stuff and then some. A plot like that, you might say its a bit too ambitious, maybe a bit too much action and excitement for one average sized book. But you almost certainly wouldn't look at that and say it sounds boring. I went into Nights of Villjamur expected to be challenged, and challenged I was. But it wasn't because the plot was so complex, the prose so twistedly weird, no, the challenge was to finish the damn thing. A challenge I failed. The problem, well, one of the problems, is that Mark Charan Newton is all tell and no show. I can't think of one examples in the three quarters of the book I made it through where Newton actually shows something. It's all, 'Bob walked down the stairs, he was tired and also a little hungry. He passed John, who he didn't like because four years ago he cheated at a game of poker.' Obviously that's not a dirct quote, but seriously you could open it to any page and find a quote not much better. This telling over showing is particularly evident when we look the character Brynd. He's commander of the elite night guard, an albino, and a closeted homosexual. Everyone mistrusts him because he's an albino. I know this not because we ever actually see anyone mistrusting him, but because he, you guessed it, tells us. Or other characters will think, 'here come Brynd, I don't trust him because of his freaky white skin.' Another book I read recently had a character who, like Brynd, was an outcast because of their genetics. I'm referring to Jant Shira, from the excellent Castle trilogy. Throughout this books we see other characters too unnerved to meet Jant's eyes, obviously highly uncomfortable in his presence. He obviously makes people nervous. No one ever acts like Brynd bothers them, they just tell us he does. Mostly I'm just really disappointed. This book had such crazy amounts of potential, and I felt like the character of Brynd in particular could have been pretty amazing. Could have been, would have been, but ultimately wasn't. Maybe the next books in this serious are better, but as I couldn't even finish this one I don't know if I'll ever find out. Thanks for taking the time to try this - sorry it didn't work out for you.